NETWORK FINALS: The MODERN FAMILY rerun gained 0.1 in final numbers, while the 8PM SVU rerun lost the same. There were probably local preemptions for CW, because the night’s reruns went from a preliminary 0.3/0.3/0.3 to 0.1/0.1/0.2. CABLE HIGHLIGHTS: FX’s FARGO returned at 0.40, within range of its Season 2 0.48 premiere and 0.49 finale. On Syfy, the season finale of THE MAGICIANS ticked up to 0.27, and the season finale of THE EXPANSE was up 0.03 to 0.18. The season finale of Sundance’s HAP & LEONARD fell off the chart, down 0.02 to 0.04/167K. TNT’s NBA PLAYOFFS games were once again dominant at 1.71/1.57, led by Portland vs. Golden State. VH1’s BLACK INK CREW shed 0.02 to 0.64. On Bravo, REAL HOUSEWIVES OF NYC gained 0.04 to 0.48. On TLC, MY 600-LB LIFE rose 0.08 to 0.44, and SKIN TIGHT was up 0.03 to 0.32. On Lifetime, LITTLE WOMEN ATLANTA climbed 0.06 to 0.38, and LITTLE WOMEN DALLAS was up 0.08 to 0.37. HGTV’s HOUSE HUNTERS was at 0.35, HOUSE HUNTERS INTL was at 0.33, and PROPERTY BROTHERS was at 0.29, after the night began with a SMART HOUSE special at 0.24. OWN’s GREENLEAF ticked up to 0.34. On MTV, CATFISH gained 0.06 to 0.34, and ARE YOU THE ONE was up 0.01 to 0.19. ID’s MURDER CHOSE ME dropped 0.04 to 0.31 and SEE NO EVIL was down 0.02 to 0.27. FXX’s ARCHER ticked down to 0.28. On Discovery, THE LAST ALASKANS dropped a tick to 0.27. E!’s TOTAL DIVAS was down a tick to 0.26. 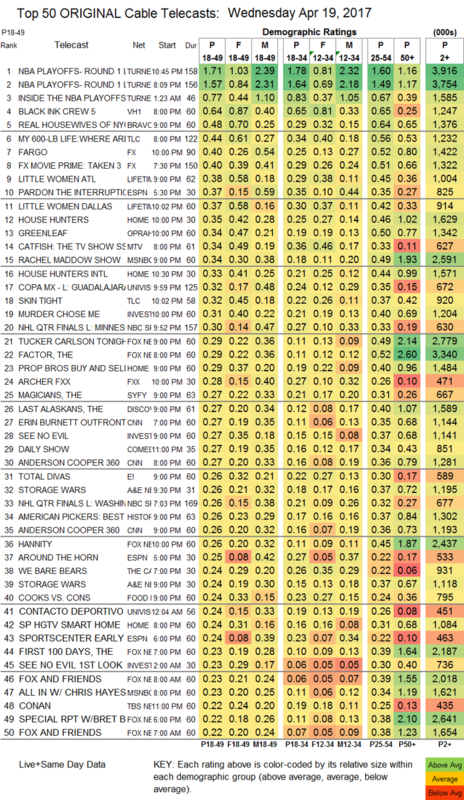 On A&E, STORAGE WARS was at 0.26/0.24, compared to last week’s 0.31/0.29, and BILLY THE EXTERMINATOR was at 0.21/0.20, compared to 0.24/0.23. Food Network’s COOKS VS CONS gained 0.05 to 0.24. WGN’s UNDERGROUND rebounded from last week’s drop, up 0.07 to 0.19. Comedy Central’s COMEDY JAM found an extra 0.01 for 0.13. IFC’s BROCKMIRE was also up a tick to 0.11. 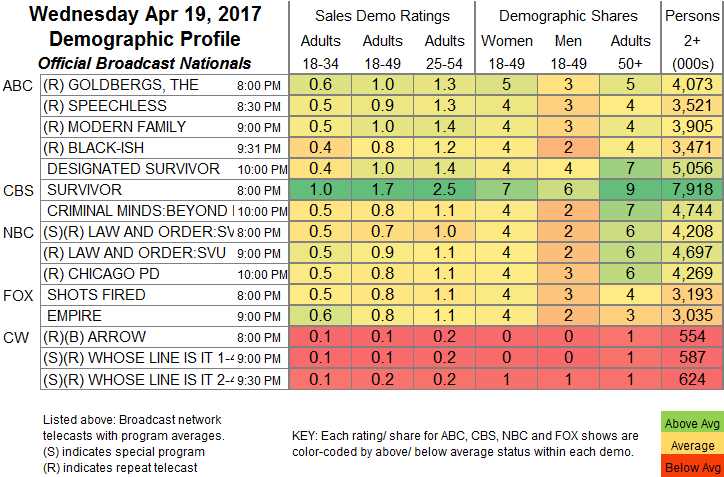 On TV Land, LOPEZ was down a hundredth to 0.07, and NOBODIES was steady (off the chart) at 0.06/385K. POP’s original comedies remained off-chart, as HOLLYWOOD DARLINGS held at 0.03/176K, and RETURN OF THE MAC was up a tick to 0.03/91K.